On the EEX transparency platform market-relevant generation and consumption data is published at a central and neutral site, close to the market, in order to further increase transparency on the wholesale market. This implements both statutory publication requirements and voluntary commitments by the industry. The platform was established by the four German transmission system operators, 50Hertz Transmission GmbH, Amprion GmbH, EnBW Transportnetze AG and TenneT TSO GmbH, which are legally obliged to publish power plant and consumption data, together with European Energy Exchange AG (EEX) in October 2009. The platform is operated by EEX. 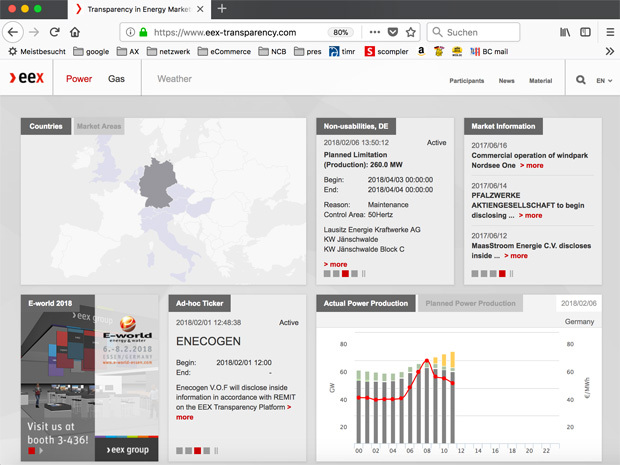 In December 2010 the Austrian transmission system operator Austrian Power Grid AG joined the platform as a full member and it has submitted data regarding the APG balancing zone since 1st July 2011. The German and Austrian regulatory authorities are responsible for examining whether the implementation of the publication requirements is carried out properly. In this context, it has to examine in particular whether a company providing data has made the data available on time and to the required extent. Usually, the transmission system operators provide this information to the regulatority authorities upon request. The regulatory authorities do not have a permanent right of access to the individual data. Log in | 66 queries. 0.854 seconds.